One of the MANY reasons I love Toastmasters is that it is like chicken soup for my soul. I’ve met so many people in the Columbus area that I likely wouldn’t have otherwise, and I’m working on my public speaking and leadership skills. Tonight after our meeting, I spoke to one of our longtime members, David Hill who achieved one of the highest achievements in Toastmasters, the Distinguished Toastmaster (DTM). Less than .5% of all of the Toastmasters (and this is an organization with 345,000 members+ worldwide) are recognized at this level. David shared with me that he liked a lot of my ideas and would like to work with me to get to the next level of my Toastmasters journey. Mentorship is a big part of Toastmasters and something our new club president, the lovely Ann Ruege (my birthday twin) wants to bring to the forefront in the upcoming year. This isn’t just a pat on the back or a handshake. This is a relationship with someone who supports you and wants you to succeed. Someone who values your input and can help talk you through professional or personal issues. So no one cared about mentorship until recently? Is this just a buzzword? Is he senior to me in Toastmasters? You betcha! Can I be a mentor to him? Absolutely! Say what?! Yes, in addition to talking about Toastmasters, David is also interested in building a brand and getting his name out there. This is something I’m going to be talking about in the District 40 Toastmasters Fall Conference. We have worked together for almost a year now and our skills complement one another. Tim is creative and has a unique perspective being a high school computer science teacher. I know I can go to Tim to get the scoop on new technologies and for a perspective with an education lens. Anna is a data wiz and I’ve learned so much from her about the importance of data. She also is driven to learn about instructional design and I want to say when she’s rich and famous that I knew her. Natalie has this great aptitude to work through any issue and make it work. She’s one of the best problem solvers I’ve ever met. Our powers combined we’ve been able to do some pretty special things. The pic above was taken when we finally all met face to face. We presented at an OSU conference together based on some research and a project we had completed. We are also presenting at our first big academic conference together this November. We also worked on a cool project for OSU’s College of Nursing and we hope to take that inspiration to South by SouthWest EDU. Of the group members, I was the only one with formal work experience in instructional design but by working with them, I’ve become a much better instructional designer! Have you ever met someone who you absolutely hit it off with from the start? That’s how I felt when I met Dr. Ana-Paul Correia during my first advising appointment. She doesn’t take no for an answer. She has continually pushed me to do more and reach higher levels since I’ve known her. It’s an interesting relationship because even though she’s my professor and advisor, I’m also her work colleague in the College of Education and Human Ecology at OSU. When she encouraged our team to apply for the AECT conference, I didn’t think we had a chance of being chosen to present. I’m glad I am wrong. APC, as I like to call her, is getting ready to start her 2nd year at OSU after previously teaching in Iowa. As she has helped me with becoming better academically, I’ve helped her on the practitioner side of things by getting her more involved in the Central Ohio ATD and sharing my local network so she can help become acclimated to Columbus. I’ve also helped her navigate the OSU system which in itself is a job. Of course, this isn’t every day, but I can say most days I have no problem getting up and going to work in the morning. I’m lucky to work with a cadre of people who not only allow me to be my weird self but also encourage me to come up with new ideas. Especially in a university, it’s hard to be innovative. I have had some great leadership including Brooke Parker, Dr. James T. Austin, Dr. Dawn Snyder and Traci Lepicki who have continually helped me grow as a young professional. They also let me be heard and express my ideas, which I appreciate. Immediately I wondered if I had something stuck in my teeth or if I was wearing my breakfast on my shirt. She then went on to ask me what I was doing with my career and she told me I had a talent with social media that I should capitalize on. By her saying this it watered the seed that had been planted deep in my head about running my own business. Not only did she encourage me more than she’ll EVER know, BUT she also introduced me to Ahn who has taken me under her wing, gave me a chance to work for her, and is showing me the business side of digital marketing. I am so grateful to Debbie and Ahn for their support of me and The Learning Camel. 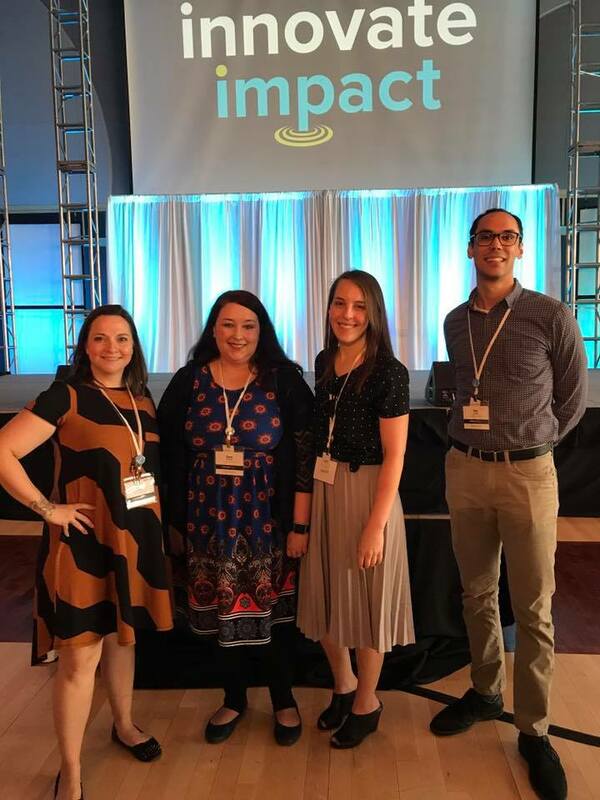 I’ve been pretty lucky to be able to help manage the social media of several organizations including my Toastmasters club, Central Ohio ATD, & Ohio Instructional Designers Association. These volunteer experiences have been great for me and I will always include volunteering as part of my professional life. Then there is the TLDC. If you don’t know the TLDC, it is The Training Learning and Development Community. 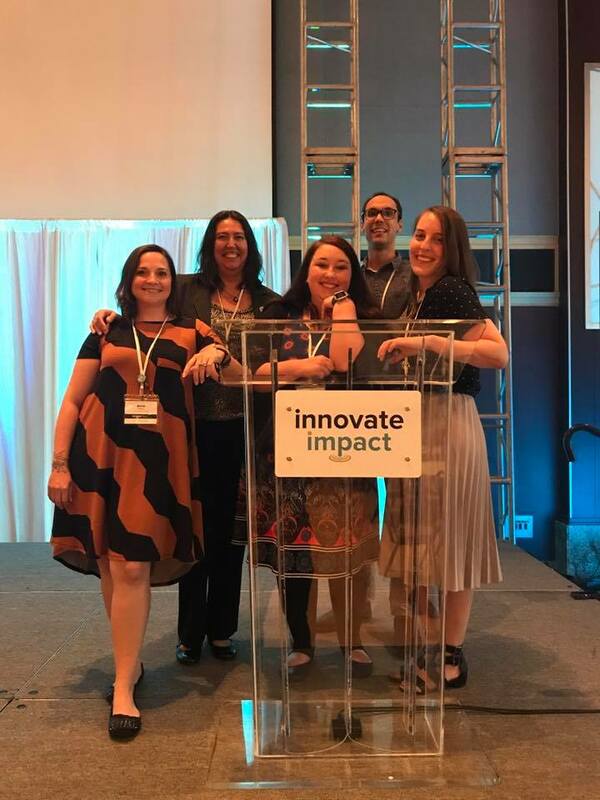 It was founded by two former Elearning Guild employees Brent and Luis who wanted to develop a positive community for learning and development professionals. Every week day there is a live show via Crowdcast.io and topics are discussed about various pain points people may have or there are guests that share their perspectives. I’ve never watched an episode where I didn’t learn something (yes, Anthony and Ajay you’re episodes have value too :p). If I can’t watch the episode live, I hit up the replay. I volunteer for TLDC, helping manage their social media and writing up the daily show notes. How did I get this gig? I asked Brent and Luis a question about the format of the show, specifically, why my question didn’t get answered after they asked for participants to add questions in the Q&A box for the speakers. This led to another conversation about me (let’s face it, why on Earth would they know who I am?) and it led to me becoming a volunteer. From this community alone, I have been able to meet some of the community members face to face including Katie Stroud, Sam Rogers, Lisa Robbins, Joe Ganci, & Brent Schlenker. On top of that, I’ve started talking more to people who are not necessarily IDs, but provide a lot of value to challenging my perspectives and processes. This list includes Mike Simmons, Mike Lenz, and Jason Noxon to name a few. Then, one more level here, I’ve met this AMAZING ID in Scotland Bethany Taylor and we have set up periodic Skype calls to talk about our work and talking through how to approach things. I’m proud to be one of the volunteers, working alongside Craig to support this amazing community. If this isn’t the best example of mentorship being a 2-way conversation, I’ve got nothing else for you. 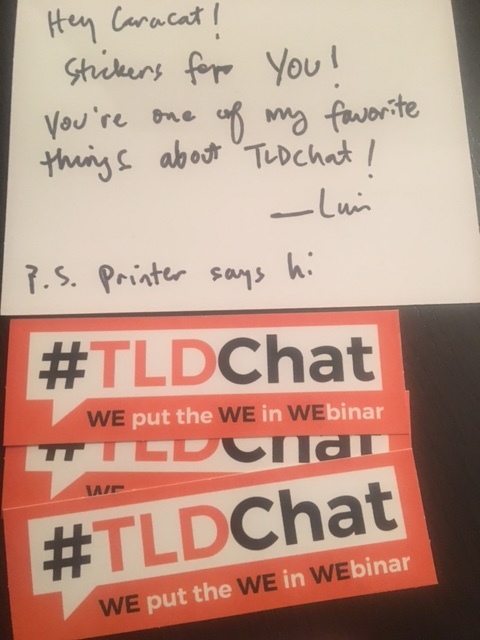 Plus, TLDC has stickers! You don’t need a turkey and fake leaves decorating your home to be grateful. It took a traffic jam for me to think this through but I wanted to take some time to write this out and just say thank you. I am humbled by the fact that I know so many kind and giving people that provide so much value to my professional career. Have you thought about who you have mentorship relationships with? Have you told them how much you value them?